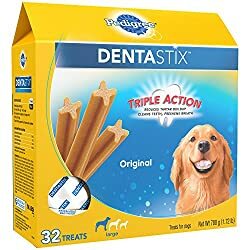 Below are more detailed reviews of the best dog dental chews, dog breath cleaning and dog teeth cleaning products. There are lots of methods and products to clean a dogs teeth or help a dog with bad breath. Methods include brushing a dogs teeth, giving a dog a teeth and breath cleaning chew, or adding a dental cleaner to your dogs water. Here are the top 5 teeth & breath cleaning products for your dog. A Dogs breath is an indication of oral health. 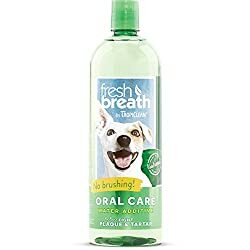 Using Tropiclean Fresh Breath Plaque Remover Pet Water Additive made with natural green tea will not only give 12 hours of fresh breath, but will reduce plaque and tartar. The bottle contains almost 34 ounces of liquid (about 1/4 of a gallon). Ingredients include purified water, citric acid, Cetylpyridinium Chloride, Chlorophyllin, Glycerin, Potassium Sorbate, and Green Tea Leaf Extract. Simply add to your pets water (though not too much to start. We suggest using a few drops at first, then increase the amount slowly up to the recommended dosage.) We give Tropiclean Fresh Breath Plaque Remover Pet Water Additive our exclusive FIVE STAR rating! Clean teeth mean better breath, normal chewing, and reduced chances of tooth decay, yet many pet owners will only have their dog’s teeth cleaned at the vet once a year or less. The good news is that owners can help their dog on their own and once they get their dog into a routine, it’s easy to keep up with dental care. For a first-timer though, the task can feel a little daunting. To make the process go a little smoother, owners should consider the following tools before they get started. Believe it or not, some dog owners consider it entirely normal to brush their dog’s teeth after every meal just like they would their own. 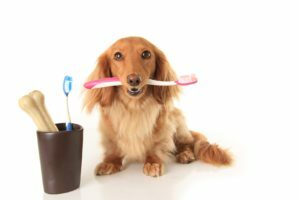 A dog toothbrush isn’t all that different from a human toothbrush, but owners have to be aware of the consistency of the bristles. 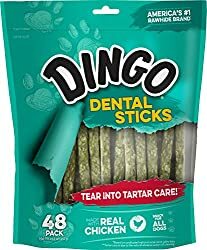 If they’re too hard, they can damage the dog’s gums over time. There are specific toothbrushes that are made for dogs, but a child’s toothbrush or even a finger wrapped in gauze will also be able to remove a significant amount of plaque after meals. Dog toothpaste doesn’t come in mint or cinnamon varieties. Instead, it favors the same meat flavors an owner will find for their dog’s treats. Human toothpaste won’t harm a dog’s teeth, but it can hurt the dog’s systems if accidentally swallowed. For those who don’t want to buy yet another item for their puppy, it’s easy to make toothpaste out of everyday household items with natural antibacterial qualities. For example, turmeric, kelp, and parsley make a simple paste that can both clean and whiten a dog’s smile! A tooth scaler is a scraping tool designed to get at the difficult to reach tartar in the mouth. Many people swear that this tool takes their cleaning to a new level because it aids in really attacking problem areas that normal brushing simply can’t address. However, this tool is sharp and can potentially be dangerous for both the owner and the dog if the dog unexpectedly jerks or balks due to a painful stab of the scaler. Experts recommend this tool be used gently on dogs who are used to in-home dental care. This product is designed to care for a dog’s teeth without the need of brushing or scaling. It uses natural enzymes and products to disinfect, remove build-up, and fight gum disease. At the very least, it should make a dog’s breath a bit easier to handle. Marketed toward busy pet owners who may not always have the time or the energy for a full brushing, this oral care gel can be squirted onto a finger and then quickly rubbed along a dog’s teeth on both sides of the mouth. New users to the product can start at twice a week and then move up from there. The amount of cleaning a dog needs will depend on everything from their diet to their body chemistry. Some will need frequent cleanings to keep their teeth intact, while others will have teeth that seem to magically stay clean and white without any help from their owner. It all depends on what the owner feels their dog’s teeth need. 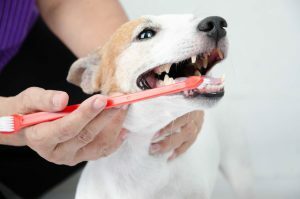 Most vets will say that even with the best of in-home dental care though, dogs should still be getting their teeth professionally cleaned once a month. Why Brush a Dogs Teeth? Your dog will benefit immensely when you incorporate tooth brushing into your daily regime. You can use a regular toothbrush to do this, and it is recommended that you use a brush with soft bristles. Purchase canine toothpaste that is safe for your furry friend to swallow, and it will have a flavor, like poultry or seafood, that your pet will enjoy. Stay away from toothpastes designed for human beings, as these contain detergents and other ingredients that are not intended to be swallowed. Start slowly, and work your way up to brushing longer, as your dog becomes more comfortable with having his or her teeth brushed. What Other Ways Are There to Clean a Dogs Teeth? If your schedule does not permit you to brush your dog’s teeth, you can always use a dental chew, to clean your pet’s teeth. While not as good as brushing, this still prevents a layer of plaque from accumulating. Clean your pet’s gum line as well. You can also use a piece of gauze wrapped around your finger if you do not have access to a dental pad or wipe. 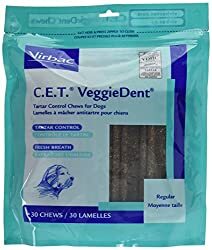 Encourage your pup to munch on a dental chew after dinner. Choose quality food for your pet. Foods like meats, fruits, and vegetables. Avoid grains, as these are sticky and will be more likely to leave residue behind. You can also provide carrots, apples, or pumpkin, and this will also work to remove food particles and debris from your dog’s mouth. Keeping your dogs teeth clean and healthy, along with providing the proper amount of diet, exercise and giving your dog the best nutritional hip & joint supplements, will give your best friend many future healthy years of life. Dog Food Types & Products - What's Best for Your Dog?